The product owners of the mEducation Alliance website contacted us in September, 2015 to provide ongoing monthly Drupal security and module updates. The site is a partnership between World Vision, USAID, Peace Corps, and UNICEF – just to name a few. World Vision reached out to us to take over the monthly maintenance and retainer development support on the Drupal 6 site. 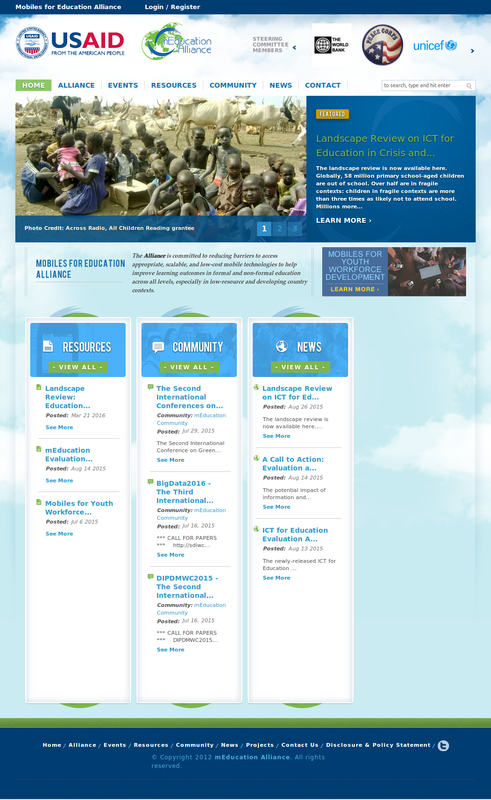 World Vision’s original goal was to make the site mobile responsive, possibly upgrading the D6 site to D8. We started by first setting up our own dev and staging environments, so we can properly develop, then push up to stage development work, while running our screenshot comparison tools. Next, we scoped work to begin cleaning out their theme files. This is when we really dug in to get the site cleaned up. We rebuilt page templates using Panels. Identified that their rhead.php should be replaced with more standard html.tpl.php and meta tags/scripts added using contrib modules and drupal_add_js calls. We moved all of this to modules, outside of the theme. Moved views templates into appropriate locations/subfolders. Updated View templates and removed logic. We’ve also addressed further issues, such as removing duplicate modules and spam prevention. The end result is that they have a much more stable website, which isn’t buggy when they are trying to update content. Ultimately, mEducation Alliance is holding on moving over to Drupal 8, but we’re hopeful they’d like to make the leap, as Freelock is currently developing two brand new website build-outs in Drupal 8! Freelock is currently offering a free Drupal 8 migration dry-run with purchase of our Site Assessment. Please contact us for more information!